Captain Jack: Immortal. Lover. Crime fighter. He's like a sexier version of Batman. John Barrowman is already regarded by many to be one of the sexiest (if not the sexiest) actors to appear in the Doctor Who universe. Not me, of course. I'm a bow tie man. 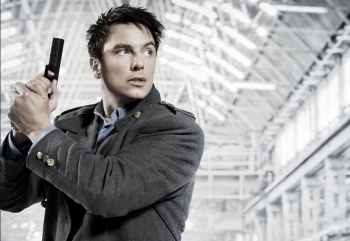 However, Barrowman just became even more swoon-worthy, since he's now a crime fighter with a heart of gold. Barrowman was in Newcastle, attending a concert with his parents. When he returned to the hotel in Glasgow where he was staying, he suddenly stumbled across a scuffle involving hotel staff and some thieves. It turns out that a woman and her husband had been woken up by two boys ransacking their room, and one of the kids punched a staff member during the ensuing escape attempt. "I grabbed the kid's ankles, yanked him to the ground and then pulled him out into the hallway. I pinned him down. My tour manager then arrived and the three of us held him down until the police came." That's not where the story ends. Barrowman, who was saddened to see a kid who is only 14 or so and "on drugs" said he'd like to help him out and possibly give him a job. Barrowman's been pretty adamant about how he's hoping to be a part of the 50th anniversay celebration for Doctor Who. If he keeps on acting like a real life superhero, I don't foresee him having much trouble getting fan support.